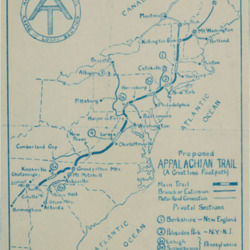 The Appalachian Trail provides an escape to the natural world. Those who believe the trail is too treacherous for all to experience or those who are under the impression that thru-hiking is the only way to benefit from the Appalachian Trail, are highly mistaken. People of all backgrounds and histories can gain the experience Benton MacKaye envisioned when visiting the trail. According to The Appalachian Trail Conservancy, "many folks with disabilities have visited and even spent a lengthy amount of time on the Appalachian Trail", plenty of whom kept daily journals of their inspiring journeys. Currently, new advances in technology have provided people with disabilities greater opportunities to visit the trail and the Appalachian Trail Conservancy has put together a guidebook, providing increasing opportunities for accessibility.